Have fun with this trendy zipper earbuds! Designed to give you untangled comfort and convenience. With a cord that is 42” long, you can connect to all of your gadgets quickly and without any hassle. Have fun with this trendy zipper earbuds! Designed to give you untangled comfort and convenience. With a cord that is 42” long, you can connect to all of your gadgets quickly and without any hassle. The unique patented design and bright colors are sure to grab the attention of your customers. 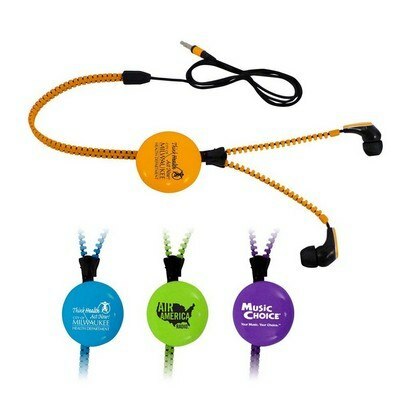 Get these zipper earbuds in aqua blue, lime green, orange or purple color for your next custom giveaway. Imprint your company logo on the zipper toggle and promote your brand in innovative style!